The best thing for Ukraine is to force NATO, the US, and regional players out of the country, former US congressman and presidential candidate Ron Paul said. Without foreign meddling in the civil war, Kiev will focus on the nation's economic collapse. 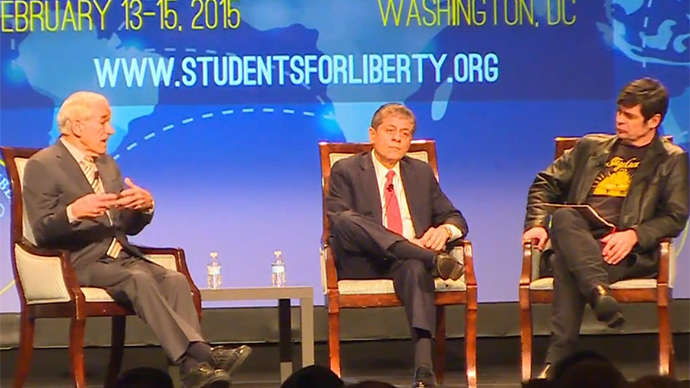 Paul’s speech followed the NSA surveillance whistleblower Edward Snowden’s presentation. “I’m not pro-Putin, I’m not pro-Russia, but I’m pro-facts,” Paul stressed when defending his stance. “Crimea is not exactly a foreign country, according to the Russians. But I’m neutral on that,” the former presidential candidate stated. 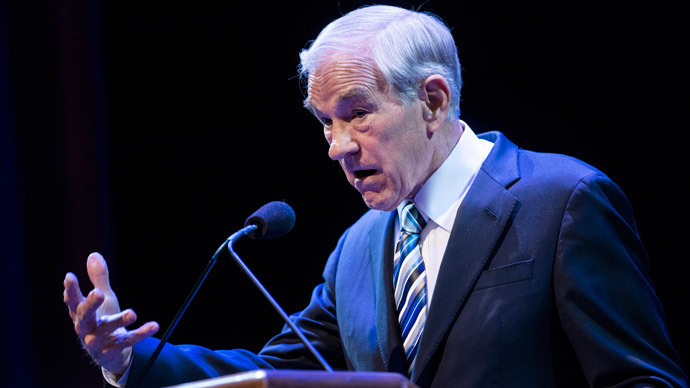 READ MORE: Ron Paul to Obama: Let’s just leave Ukraine alone! When the uprising in Kiev in early 2014 led to the ousting of then-President Viktor Yanukovych, Paul urged in an op-ed that the US must “keep [its] hands off Ukraine and let them solve their own problems.” Several US officials, including the US State Department’s Assistant Secretary of State for European and Eurasian Affairs Victoria Nuland, have been accused of meddling into Ukraine’s internal affairs. Protests in central Kiev have since largely subsided, and Petro Poroshenko, the country’s current leader, was democratically elected in late May. However, this did not solve Ukraine’s problems, as Poroshenko supported the so-called “anti-terrorist operation” against the country’s eastern regions, which was launched by the coup-imposed interim government. Kiev sent regular forces and volunteer battalions to the Donetsk and Lugansk regions earlier in April, after rebels there refused to recognize the country’s new authorities. The dispute in the Ukrainian regions in February 2014, along with the addition of the new government’s controversial bills and a push for “lustration” of the officials who served under Yanukovich – all of which caused discontent and resistance in the southeast – eventually triggered a full-blown conflict after the sending in of troops. Since then, militia forces have been pushed further east from the areas they initially occupied, but have regained control of the major cities of Donetsk and Lugansk, where the majority of the population supported the anti-government movement. Hundreds of civilians have been caught in crossfire. Officials of the two self-proclaimed republics have claimed that Kiev troops, including nationalist battalions, have deliberately been shelling residential areas as retribution, while Kiev officials blame what they call “Russian terrorists” for staging provocations. Moscow has repeatedly called for the Ukrainian government to stop its military operation, to begin inclusive nationwide dialogue with the rebel regions, and to carry out a constitutional reform that would ensure federalization of the country – something which Poroshenko categorically rejects. The latest breakthrough in the conflict is the Minsk ceasefire agreement, which has offered some hope that the fighting may come to an end. The deal was reached on Thursday, following marathon overnight negotiations between Ukraine, France, Germany, and Russia. It was also signed and later ratified by the Ukrainian rebels. The document stipulated a ceasefire starting at 00:00 on February 15. The talks were part of a Franco-German initiative. 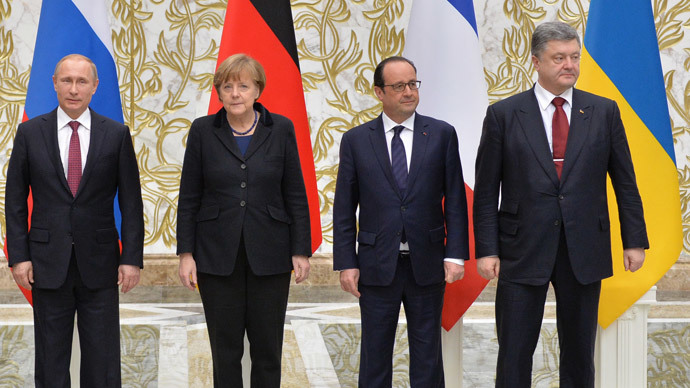 President Francois Hollande and Chancellor Angela Merkel visited Kiev and Moscow before meeting the Russian and Ukrainian leaders at the negotiating table in Minsk. Russian President Vladimir Putin recently criticized NATO's involvement in the Ukrainian conflict, claiming the Ukrainian army is essentially a “NATO legion” which fails to “pursue the national interests of Ukraine” and is interested in restricting Russia. Meanwhile, Russian Foreign Minister Sergey Lavrov blamed the US for pursuing steps that “only promoted further aggravation” of the conflict. “Through every step, as the crisis has developed, our American colleagues and the EU under their influence have tried to escalate the situation,” Lavrov said during a security conference in Munich on Saturday. Lavrov highlighted the EU's failure to engage Russia about Ukraine signing an economic association agreement with the bloc, Western involvement during the Maidan protests, and the failure of the West to condemn Ukraine for calling its own citizens 'terrorists' and for supporting a coup which led to the toppling of the democratically-elected president. Russia’s envoy to NATO, Aleksandr Grushko, said on Thursday that lethal weapons deliveries to Ukraine – a possibility being considered by Washington – would be unacceptable and would potentially have dangerous and unpredictable consequences.